Dinners are served all day, everyday. French fries, coleslaw, potato skins, mashed potatoes, or baked potato. 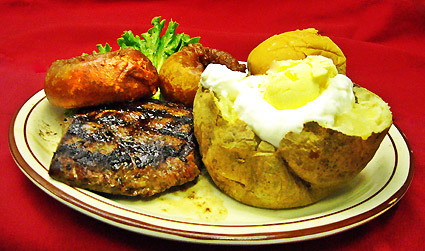 A flavorful half-pound USDA Choice sirloin steak grilled to your liking, topped off with a couple of our hand-battered onion rings. An eight-ounce wild-caught salmon fillet baked with butter and lemon. 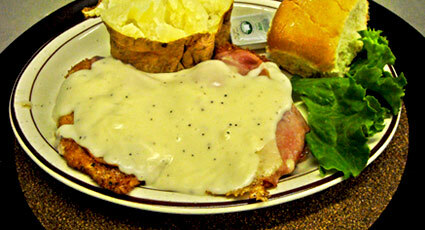 Ten ounces of breaded chicken breast topped with Canadian bacon and Swiss cheese then covered with cream gravy. Ten-ounce chicken breast lightly breaded, sautéed and covered with broccoli, mushrooms and hollandaise sauce. Tender fillet of Alaskan cod baked with lemon juice and butter. Served over rice instead of choice of potato. Tender calves liver smothered with sautéed onions and bacon. Jumbo shrimp fried in a coconut batter served with honey-mustard sauce. 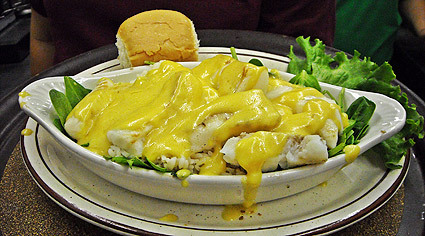 Our baked lemon cod served on a bed of crisp, fresh spinach topped with rice and blanketed by rich, creamy, hollandaise sauce. Choice of side item not included. Four jumbo shrimp dipped in tempura and deep fried to a golden brown. Chicken breast marinated in teriyaki sauce served on a bed of rice with pineapple. Not served with choice of potato. Homemade lasagna cooked in a rich meat sauce. Plenty of pasta, so no potato is served with this item. A half-pound portion of crispy fried steak smothered with cream gravy. *These items are cooked to order. Consuming raw or undercooked meats, poultry, seafood, shellfish, or eggs may increase your risk of foodborne illness, especially if you have certain medical conditions.